"The engraving can be dated to be prior to 1825 by the structure of the church. On examination of each page in detail, the added captions may be read as 'J. Atkinson dol.' and 'W. Radclyffe South'. Speculation is that this work may have been commissioned by J Atkinson from the engraver William Radclyffe to form a memorial token for the infamous Atkinson Mill fire in 1818. Although many references to engravings by William Radclyffe have been found, none so far relate to this particular subject." At the beginning of June 2018 I received an e-mail from 'Geoff' to say that the poem had been found in an online copy of The British Poetical Miscellany. 4th edition edited by "Smart" and in fact written by him also as an Elegy to Mary Beaumont who died aged just fifteen (see https://tinyurl.com/y8rxoese). Also, if you go to the beginning of the book under the heading 'contents' (actually nine pages in) you will see the engraving used as a frontispiece! Now knowing her full name Mary Beaumont and that of her father it was an easy task to locate her burial in the Kirkheaton burials spreadsheet (downloadable from this site). Also, her grave could be located and its memorial inscription read together with an additional memorial inscription tablet just inside the church on the left when entering the main door. This of course disproves the speculation of a direct connection between Mary and the mill fire. Sandra, from the Kirkheaton History Group, then set to work to track down additional information about Mary and has so far found out that it is probable that Mary's aunt, Hannah Foster, married Thomas Smart (the poet) prior to Mary's death and so was well placed to write the elegy for the Beaumont family. Also of note is that Mary's father Joseph was a well-known merchant manufacturing 'Fancy Waistcoats' which were very popular at this time, Kirkheaton being a significant centre for the trade. His wealth, passed down to Mary's brother John, allowed John to build the house at 'Ravensknowle' which is now a well-known museum situated in the Dalton area of Huddersfield. "A.J. Atkinson del[iniavit] (= 'drew') and W. Radclyffe sculp[sit] (= engraved) are the illustrators. According to various biographical dictionaries of artists and engravers, J. Atkinson may have been John Augustus Atkinson (1775-c.1833), a painter, engraver and printmaker; and W. Radclyffe may have been William Radclyffe (1783-1855), the engraver who was a founder-member of the Birmingham Academy of Arts." Not all aspects of the engraving have been explained however. In particular, who commissioned and paid for the work and where is the original engraving? Also, is there any significance regarding the seated gentleman? 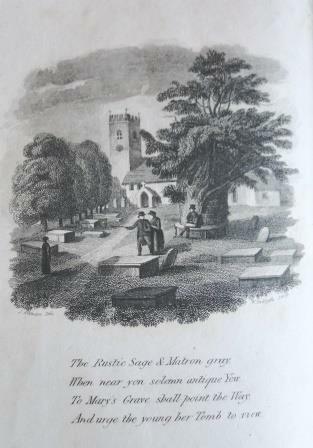 The artist certainly took some licence with the engraving's perspective as can be seen by visiting the site - the Yew tree in particular is in reality significantly further to the right than depicted. Registered users may add comments regarding this article to the Forum or Contact form. This page will then be updated as appropriate.